Remember PeakNation™, this is coming from a man who earlier this year had the claim that he was the “deciding vote” on Obamacare refuted by fact checking organization “because his vote was not up for grabs.” Udall has been such a rollover for President Obama and whatever Obama wants to do that people just know his vote for Obama’s agenda is already assured. 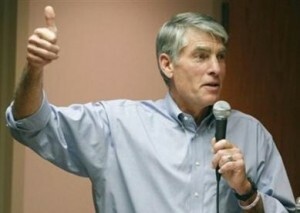 Last time we checked, it was Udall running away from Obama, not Obama running away from Udall. Even on issues like the NSA, an issue Udall claims to be so vital to our privacy, safety, and liberty that he talks about it anytime he wants to show Coloradans what exactly he’s been doing these past six years besides rubber-stamping whatever Obama wants. Yet, if this issue as dire as Udall claims, it’s bizarre the strongest response Coloradans can get from our mighty defender is a letter writing contest. This coupled with his extremely liberal voting record, voting 99% of the time with Obama’s agenda, makes Udall’s claim that he stands up for Colorado quite the joke. The real joke is actually on all of us here in Colorado. Absent a Senator and a Governor who knows how to stick up for us, expect Washington D.C. to continue issuing decrees that please Democrats mega donors in California and New York than what is right for us here in Colorado. Mark our words, should Udall be reelected, the overreach by the federal government on such issues like the Gunnison Sage Grouse, will only be the beginning of how Washington begins to dictate our lives here in Colorado.